A young boy is forced to take piano lessons. He becomes bored at the piano and drifts into a dream world of a maniacal super villain (Hans Conried) in a surreal world of weird people and strange happenings. Based on a story by Dr. Suess. Wild, weird and wonderful! Boris Karloff plays Dr. Frankenstein working on a new monster. A film crew are using his castle and... regretting it. Commentary by the film's actress Charlotte Austin, Tom Weaver and Bob Burns! A group a scientists get shrunk in size and injected, along with their microscopic sub, into the bloodstream of a scientist. Their mission: to blast out a blood clot fro the famous scientists brain. But the human body is a vortex of struggle when you're microscopic. Sci-fi adventure, 1960s style. This is what dreams (and nightmares) are made of! An incredible silent fantasy with an opening sequence that will stun. Extras include a 53 minute documentary, footage from an abandoned silent feature, bonus DVD of alternate 1930 version of the film and more! Stars Anthony Dexter and Susan Shaw. Astronauts discover the lost continent Atlantis.....on the 13th planet of Jupiter! The women of Atlantis want the astronauts to help re-populate the civilization. Plus, there's a monster in the woods around Atlantis too! The sci-fi/horror classic with Vincent Price. A case of teleportation gone very, very bad. It's gonna take more than a can of Raid to take care of this beast! Commentary by David Hedison. Extras: Vincent Price bio, Fly documentary, vintage Fox Movietone news promo. Stars Adrienne Barbeau and Jamie Lee Curtis. A good old-fashioned ghost/zombie movie! The ghosts of Seafarers have come back for vengence after a massacre 100 years earlier. The coastal town of Antonio Bay is in for creepy goose-flesh for every resident. Great atmosphere. Double feature: FOOD OF THE GODS (1976) Ooze from space turns a farmer's animals into giant, man-eating monsters. A Bert I. Gordon film! FROGS (1972)Ray Milland plays a no-good grump who lives on an island and poisen's all the vermin. The vermin decide to take matters into their own webbed feet! Shakespeare in space! Classic themes explored on another planet. The whole film takes place far from earth. Science fiction adventure and poetry with Leslie Nielsen, Anne Francis and Walter Pidgeon. Bonus: Robby the Robot in the fill length THE INVISIBLE BOY movie! Loads of extras! Stars Henry Daniell, Eduard Franz. Daniell steals the show as a mad, revenge-seeking voodoo priest. He sets loose an evil native spirit-zombie to do his blood-thirsty work. A top-notch effort on a low budget with the eerie-quality and "needle-to-the-top" shocker ending. Widescreen in HD. Movies in HD: FRANKENSTEIN, BRIDE OF FRANKENSTEIN, SON OF FRANKENSTEIN, GHOST OF FRANKENSTEIN, FRANKENSTEIN MEETS THE WOLF MAN, HOUSE OF FRANKENSTEIN, HOUSE OF DRACULA and ABBOTT AND COSTELLO MEET FRANKENSTEIN. Hours of extras! I remember seeing the ads for this on TV when it was in its original theatrical run...just the trailer preview scared me! Lightning flashing, graveyards and ghouls resurrected by Frankenstein. Cushing is back in the fifth film of the Hammer Frankenstein series. It's the tree monster! A native sacrifice and black arts bring a sacrificed man back from the grave as a killing beast whose bark is worse than its bite. The monster looks like a crazed refugee from THE WIZARD OF OZ's forest of talking trees. 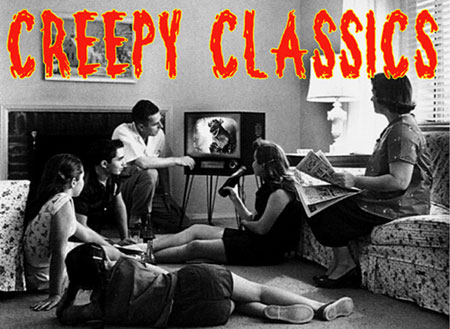 One of the best nutty horror films of the 1950's!